Alfreda is a consultant with RoadMap. She has 30 years of experience in organizational development, nonprofit financial management, planning, and leadership training. See her full bio here. Recently, I had an MRI for relentless back pain. Believe it or not, I was actually excited about getting in-side the scanner tunnel because I believed the MRI would provide data to help identify the source of pain and could point to treatments to minimize or eliminate it. Of course there was a bit of fear of the unknown—fear of what would be uncovered from getting the evidence. But I desperately wanted to learn what was happening inside my body and having an image would add to what I already understood about my body. Good news: Nothing serious. My body is just aging. Similarly, nonprofit organizations have life cycles and go through changes. And similar to an MRI, a solid assessment can give you a picture of “What’s going on?” in your organization. But while social justice organizations and alliances around the country often dedicate time to analyze the external landscape to guide their vision and strategies, they often find it hard to stop and invest in reflecting on their internal landscape in the same manner. It’s not always easy to recognize how the internal work can lead to deeper external impact. A good example of an organization making the internal investment is United We Dream, a bold network of young people around the country pushing for full equality and citizenship for the undocumented. Everyday they face changing political realities like the recent legal challenges to President Obama’s administrative actions to give young immigrants and immigrant parents of US citizen children relief from deportation. Yet even in the whirlwind, United We Dream takes time for deep reflection and internal investment to be a more effective alliance. They spent a year putting into place better structures for democratic participation and shared leadership. Every board and national leadership convening involves reflection and somatic exercises to link head, heart and hands. And just last month 80 of their young leaders launched their first strategic planning process with RoadMap to look at what they have built and where they want to go over the next five years. Internal practices are a big part of what make organizations like UWD successful. And just as understanding external landscapes are critical to any organizational strategy, internal assessments offer equally important information. Solid internal assessments can bring everyone together in a shared understanding how healthy the whole organization is and what it needs to nurture in order to thrive. 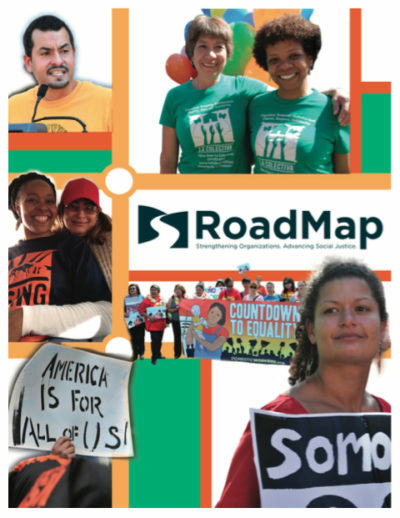 To help organizations get a clear and holistic picture of themselves, RoadMap helped develop an assessment tool specifically for social justice organizations, called My Healthy Organization. Originally created by a small group of independent consultants, including RoadMap members, MHO emerged out of a desire to provide better tools and processes for social change organizations to assess their effectiveness and that incorporated social change and movement building values and aspirations. Later RoadMap partnered with the Movement Strategy Center to create Our Healthy Alliance specifically for social justice alliances. Now in its fourth year, MHO and OHA have been used by hundreds of organizations. This month, RoadMap released a new upgraded version of MHO so that organizations can collect more information for even more thorough analysis. MHO 3.0 offers separate sections for organizations to evaluate fundraising and communications capacities, board development, campaign strategies, including theory of change, scale of base building, power mapping and more. Assessment tools like MHO/OHA can shed light on where an organization is strong and where it is weak. They provide critical data that can confirm or challenge assumptions and help organizations clarify their priorities, identify strategies needed to win and better understand what is necessary to build and run strong, capable organizations. As busy social justice organizations it’s hard to feel like there is a “right” time to take a step back and evaluate where we are and where we are headed over the long term. With so much to change and so much at stake, we are usually focused on the next big fight. But understanding where we are now is critical to having a clear understanding of how we should move forward. To sign up for a free webinar orientation to MHO/OHA, click here.